Arnott’s continue their no-holds-barred-full-frontal assault on the snack biscuit genre with the launch of yet another new range – the ‘Chocolicious Bites’ range. To be honest, I’m underwhelmed by the name; it seems very derivative and try-hard. Whilst the frankly awful ‘BigTedz‘ was designed for kids, this new range is aimed squarely at the more sophisticated adult palate – think dark chocolate squares in luxurious packaging. So what do you get in your packet? Well, the main pack contains a number of beautiful small squares which look all the world like the thing you might find on the pillow in a four-star hotel, or on your executive meal tray in your not-quite-the-front-of-the-aircraft seat. 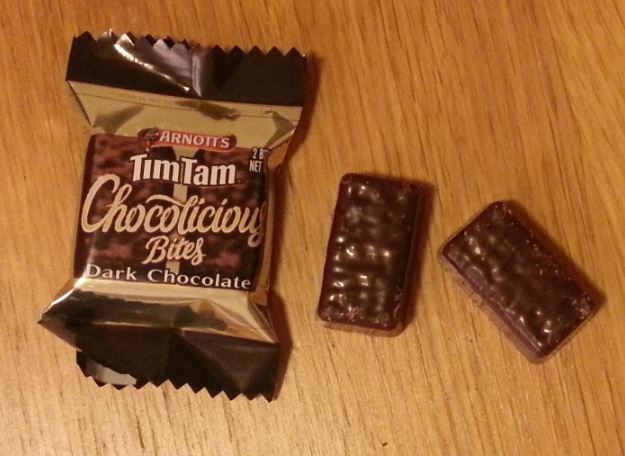 Intriguingly, inside each little packet (which measure about 35mm across) are two small biscuits – somewhat like miniature Tim-Tams, which this range is also branded with. (Arnott’s last attempt to leverage the Tim-Tam name was a rather poor effort, btw). I rather like this – it feels like you get a little bonus inside each refined yet diminutive package. One other thing worth mentioning is the extremely strong smell of spirits that assaults your nose when you open the main packet. There is a distinct aroma reminiscent of rum or whisky, which makes these feel even more grown up. It has nothing to do with the biscuits, which are not in any way flavoured as such – I can only presume it is the glue that Arnott’s have used to seal the packet. Just a coincidence, or smart subliminal marketing? The construction of the biscuits themselves is a crunchy biscuit base, which as far as I can tell seems to be the same as used in a regular Tim-Tam. 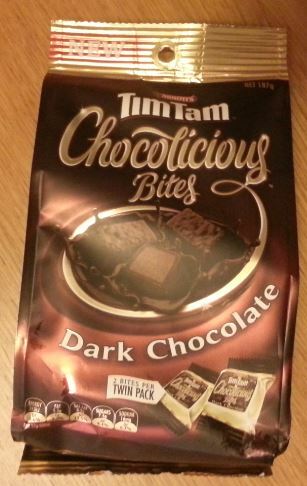 On top of this is what is described on the packet as ‘chocolate cream’, but this is nothing like the chocolate cream found nestling inside your everyday Tim-Tam. This is much richer and less soft – more akin to a chocolate truffle than a cream filling. The layer of cream is at least as thick as the biscuit. There’s no biscuit on top (so surely not really a Tim-Tam then? ), but the whole thing is enrobed in a thick dark chocolate. And it’s actually petty good. Very good, in fact. It’s very dark, very rich, and very sophisticated. To be honest, it comes close to crossing over from ‘biscuit’ into ‘confectionery’, but we’ll not quibble. They are very good indeed – although so rich that it’s hard to each all that many in one sitting. Which is either a good thing or a bad thing depending on your point of view, I suppose. 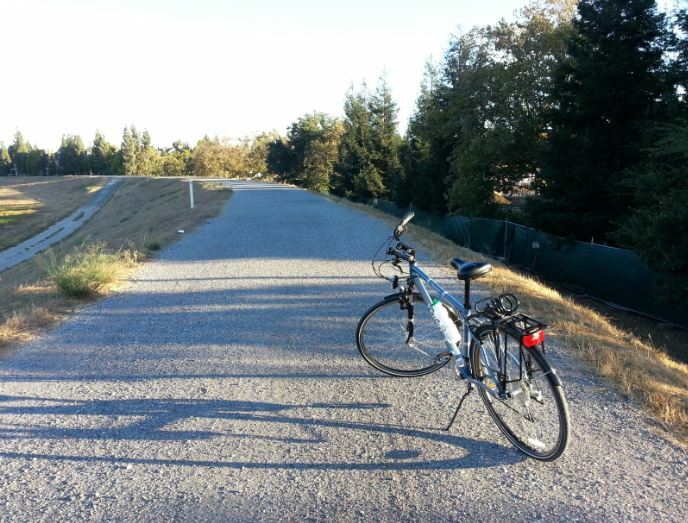 Only I didn’t; the leaves were mostly still green, the sky was blue and of course I wasn’t walking – I was riding a bike. Still, that song was still going around in my head as I pedalled around that bastion of the American Dream – Silicon Valley, California. I was there on business, and getting from the hotel to the office each day by taxi or hire car just didn’t appeal. It’s my commute to work that keeps me sane, and just because I was in another country didn’t mean I was going to give that up. So I hired a bike from a local dealer to get the five miles or so back and forward each day. I hired a basic hybrid, which did the job admirably, although it wasn’t super comfortable – I think it was a tiny bit small. But the hire guy was super helpful, waiting for me at my hotel when I arrived (late) – so I pretty much dropped of my bags and set off finding my way to the office. I wasn’t due there until the next day, but I thought a ride would be a good way to stretch my legs after the flight and work off the jet-lag. I looked up the route on Google maps (yay for the cycling directions) and set off. My inability to tell left from right, coupled with tiredness from the journey didn’t really stand me in good stead, as I went the wrong way at the very first intersection. Then, after finding my way back to the right road, again went wrong at the next intersection. Perhaps having to ride on the other side of the road was confusing me. Still, all this cruising up and down gave me more opportunity to experience Californian roads. There are a lot of Californian roads. Lots and lots of them. And they are all very wide. The sheer amount of tarmac is extraordinary. What on the map are marked as minor roads have three or four lanes in each direction. I guess they need them, as everyone is driving. There are almost no pedestrians enjoying the wide, well-maintained footpaths, and very few cyclists. For sure, I was out in the burbs, not in a downtown area, but it was quite noticeable. The only time I saw people walking was when I rode through some residential complexes, where there were people walking their dogs. Evidently this is the one activity that can’t be done in the car. In terms of cycling, it’s actually all very pleasant. Much of my route was on an off-road trail. 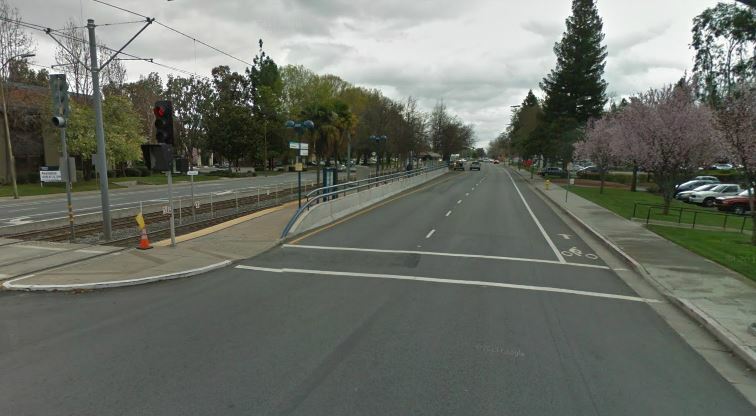 When you do get on the roads there are bike lanes on many of them, and although they are the ‘painted on’ variety the width of the lanes means there’s plenty of room between you and the traffic. And that traffic is so well behaved. It really made me reflect on just how aggressive Australian drivers are. Drivers all gave me plenty of room, stopped well back from me at traffic lights and generally drove in much calmer way than in Sydney. Those wide, straight roads would be a invitation to a Sydney driver to floor the accelerator when the lights go green in the manner of a drag-strip driver. But the Californians just pootled along, observing the speed limits and pulling away very sedately. Given all that, it’s astonishing that there aren’t more cyclists. The Caltrain (which runs along most of the cities in the San Francisco Bay area) even has a whole carriage dedicated to bikes, but I saw very few people riding – maybe two or three on each trip I made. When I got to the office, I asked where the bike parking was, and got a blank look, before being directed to a tiny bike rack with space for three bikes. Mine was the only bike locked up there for the whole week I was in town – and this is a large campus with over three thousand employees, on a road with a bike lane running all the way along it’s length. The weather is great, the terrain is basically flat – yet no-one rides. All very strange. Perhaps it was just the area I was in – I know San Francisco has a vibrant cycling scene, and reading about the area many of the cities proclaim they are ‘cycling friendly’. I wonder how the modal cycling share compares to Sydney? This is the third novel by British writer J. David Simons, and is the story of Edward Strathairn, a writer born in Glasgow in the inter-war years who then spends time both in London and Japan. It is a reflection on the different cultures and attitudes across geography and time, as the book jumps between the evolving story of Edward’s life and the contemporary unfolding of the final months leading up to his death. This switching between the present and the past is skilfully done, and the threads of the story weave together in a very satisfactory way. It is a kind of a love story, but one that explores two different types of love that Edward experiences – that for Macy, an American avant-garde artist he meets in London, and Sukimo, a Japanese hotel maid. 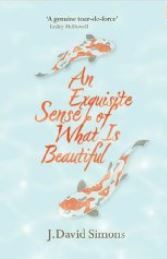 The book also explores the various viewpoints and angles of a range of events and attitudes, and in a sense is a book about perception – how the same events can be viewed very differently depending on the background and context of the observer. The pivotal event is the American bombing of Hiroshima and Nagasaki, and this traumatic event in world history is beautifully echoed throughout the book. If that sounds rather daunting, then don’t be put off – it is a very readable book that is hard to put down. If I had a small criticism it would be that the character of Edward himself does not feel completely rounded, and there are moments in the book where his motivation does not seem to ring true; as if Simons needs to move the plot along but can’t weave events together quite convincingly enough. This is really a minor point, however, which does not detract from the overall enjoyment of the novel. Definitely a recommended read.